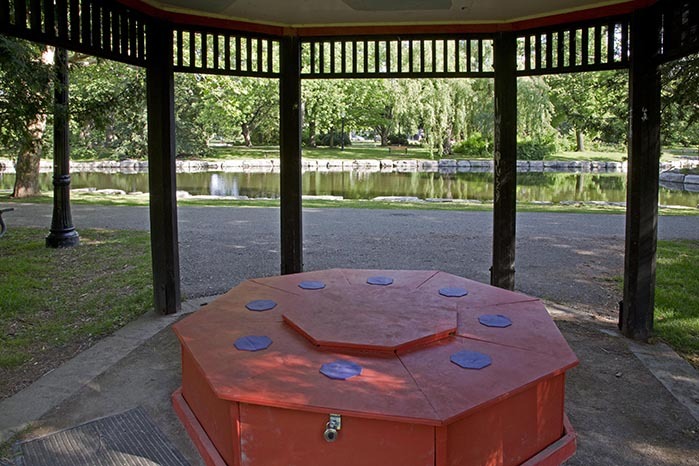 Victoria Park, Red Pagoda, along Jubilee Dr, Kitchener, ON N2G 1J2. SITCOM is an interactive bench that plays locally recorded and edited sounds from nature (i.e. underwater recordings of grand river) and human interactions (i.e. people talking). Sounds are triggered by sitting on the surface of the bench. is a sound artist based in the Toronto area in Canada. His main interests are soundscape composition and multichannel spatialization. Since 1985 he has made work for radio broadcast, concert performance, public art installations, and has designed sound and composed music for theatre and dance. His works are published by the prestigious Canadian label empreintes DIGITALes. His radio works have been commissioned by Kunstradio ORF, Canadian Broadcasting Corporation, Deutschlandradio Kultur, the NPR-affiliate WBEZ in Chicago and have received mentions from Phonurgia Nova and the New York Festivals Award. Copeland has created public art sound works for Interactive 05 (as part of Art Toronto), the Open Ears festival, and has had a solo gallery show at Gallery 1313 in Toronto and Modern Fuel Gallery in Kingston, Ontario. Copeland is the artistic director of New Adventures in Sound Art and past president of the Canadian Association for Sound Ecology. is a Vancouver-based interdisciplinary artist, musician and media artist, whose work encompasses images, sound, and text in many different configurations. He studied visual art and art history at UBC, and has collaborated in the creation of more than a hundred projects with theatre, dance and music ensembles across Canada and internationally. He is especially interested in sited installations, and audio-based performance work, and he has created performances and installations that combine contemporary paper theatre, audio art and new media on projects ranging from work with Forced Entertainment and Rimini Protokoll to Deutschlandradio Kultur to the Papertheaterfrestival Preetz. Andreas was one of the director/curators of the Western Front artist-run centre. He has taught sound design for theatre and live performance at the University of British Columbia, and has been involved in interdisciplinary projects, ranging from audio installations and radiophonic works to compositions for Gamelan, and Paper Theatre. He is currently the artistic director of the Xenographic Society and the director of the Gabriola Institute of Contemporary Art on Gabriola Island.